Join us the first of May thru August and the rest of Kansas City every Saturday 7 am-3 pm for a fun filled day! Flowers, vegetables, gourmet foods, arts & crafts all in one area. 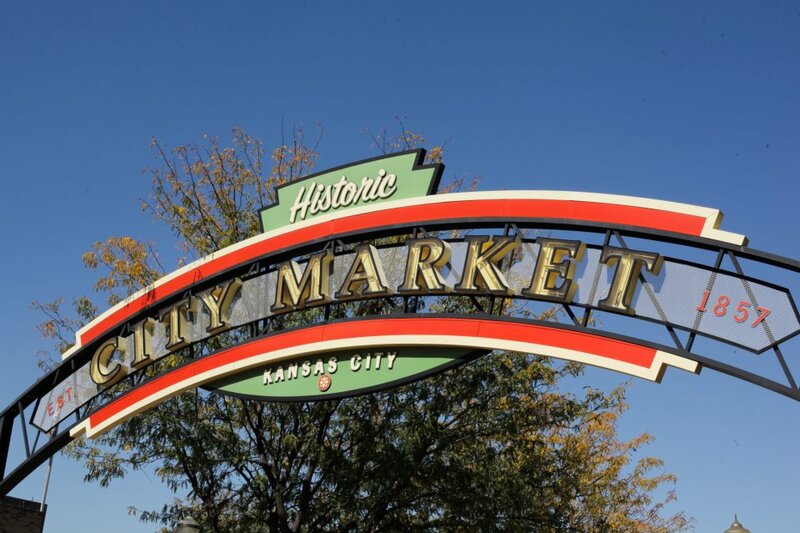 Since its inception in 1857, the City Market has been one of the largest and most enduring public farmers’ markets in the Midwest, linking growers and small businesses to the Kansas City community. Parking is FREE on weekends! It’s a day full of FREE entertainment, great surrounding restaurants and the perfect place to show off KC to out of town visitors! The streetcar has several stops around the market for easy access. 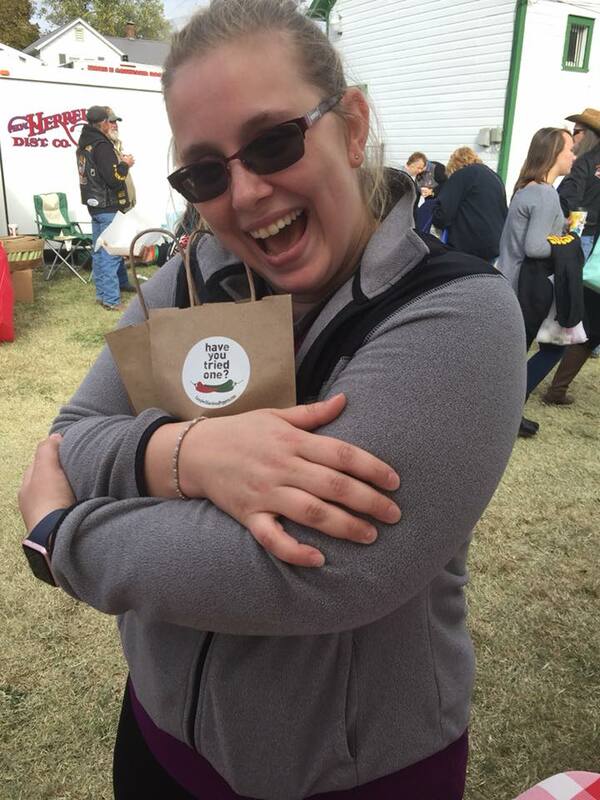 You will find us in our tent on the bricks, you will notice the crowd around our tent, the sound of spicy happiness and laughter, and the smell of sweet peppers in the air will let you know you are close! We look forward to seeing you, please be sure to let us know you are a pepper fan and we will add an extra cookbook to your purchase as a thank you for coming to see use. We will be on Park Street, booth #10. along with 100+ other vendors and food trucks! Fun, FREE and held the first full weekend in June in Downtown Lee's Summit, Missouri, home of the 2010 Great American Main Street Award. Celebrate this annual kick‑off to summer by joining us for this fun‑filled, family‑friendly festival! The largest festival of the year, activities include over 300 craft booths, with some demonstrations by crafts people and artisans. Also includes numerous food & beverages booths along with live music and other entertainment and Kids Corner. For Entertainment, shuttles, & more. A favorite of ours and one we have attended for the last 8 years. Be sure to bring your walking shoes and prepare to shop! A wide variety of artist and crafters from around the country come to this show. Find us in our usual spot, on West Grand, Booth #417, across from the Lions Den Club, they offer open jars of our peppers for your burgers and bratz, and their curly fries are something out of this world. Such a fun one day show! Located in downtown old Overland Park. Due to construction this year n the park, we will all be in a different location and will update when we know exactly where. You will find us on Row #13, Booth 1, right on the corner across from the homemade fudge! Awesome food trucks, juried 350+ crafters and good times! 12 miles south of Springfield, Missouri. Look forward to seeing our Pepper Fans! This show is close to our heart and farm, we are about 9 miles North of Mound City. I have attended this country festival for over 40 years and have the pleasure of being a vendor these last 11 years. We love this part of the country in the Fall, the hardwoods are turning color, the countryside is beautiful, and can you believe there are NO stop lights in Linn County. They provide busing in from various locations around town as well weather depending let you park in the lot if you are early! It’s the country life and the food vendors offer delicious food, and the 350+ crafters will keep you busy shopping and supporting someones dream. You will find us right down the roadway as you enter, right across from the homemade ice cream at the V in the road! What can say about Maple Leaf in Baldwin City, Kansas, except “prepare to come for the whole two days to see everything” and support small business. It is one of our largest events that we attend with over 400+ vendors and is only a 1/2 drive from Kansas City. Fall is in the air, the trees are turning colors and Baldwin City is a fun filled college town. Great food, Parade, Music and a wide variety of entertainment for adults and children. Please stop by and say hi and grab a sample at our tent! We will be located in our same location for the 10th year on 8th and High Street. They always need a jar for Grandpa! Located just off the Mississippi River this is an experience you don’t want to miss. Come hungry as there are lots of gourmet food trucks and 400-600 vendors scattered throughout this historic 4 block town. This will be our 3rd year and we enjoy it more every year! We are located right across from the beer truck by the City Hall. We look forward to seeing you! 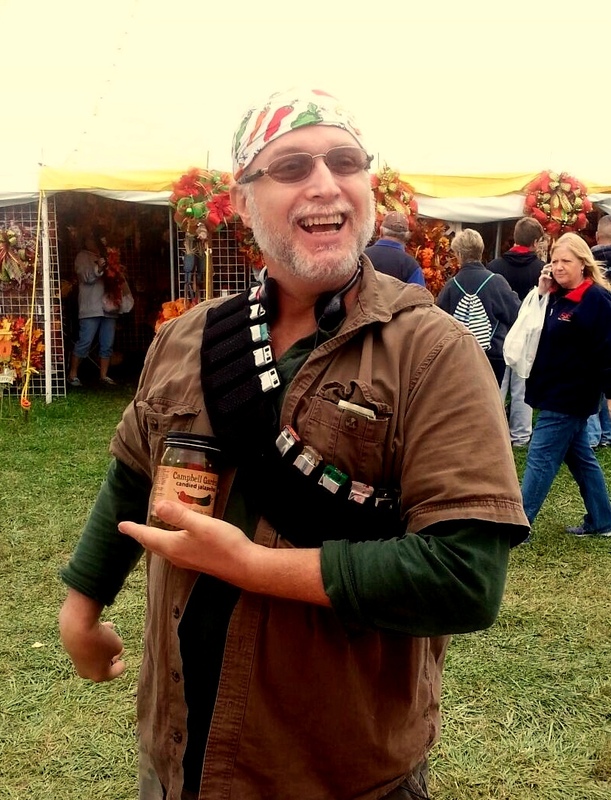 A happy Apple Butter Festival fan! This site will be updated with our indoor shows the first of Fall. Check back! The show will be FREE and open to the public!! ONE DAY ONLY, March 24th!! Doors open at 9am and close at 6pm. Come support local and small independent businesses!! This April's SPRING MARKET will not only have many of our indoor vendors from our last show but will have many NEW outdoor vendors as well! FRIDAY is Ladies Night out from 5pm-8pm!! We will have WINE for you to Sip & Shop for a fun filled evening with your girls! SATURDAY will be open 9a-4p! Admission band is good for both days! *FIRST 30 shoppers will receive an "Early Bird" shopping bag of goodies (discounts, coupons, gifts, etc from our vendors)! At least 5 of these Early Birds will find an MC Vintage gift card in their bag to use at any booth at the show. *Bring CASH* -this event takes place in a very rural, rustic, charming setting, therefore, the nearest ATM is about 10 miles. Be prepared people! Support our #SHOPLOCAL and #SHOPSMALL mission this spring at the 3rd Annual Spring Chick Event. We are popping up our outdoor festival in Downtown Olathe (Cherry & Park Streets). The Spring Chick Event will feature over 100 local vendors, food trucks, DIY classes and more. Celebrate the local arts with handmade goods, artisan foods and shop for your favorite spring fashions from local boutiques and shops. Find us in booth #144, in front of the Post Office on Chestnut Street! Downtown Olathe will soon fill with crowds of people, drawn by the smell of delicious food, the bright lights of carnival rides and the sound of live music. Johnson County Old Settlers is set to return for its 118th year on Sept. 8, 9 and 10. The three-day festival draws nearly 200,000 people every year. It includes a craft show, carnival, parade and three nights of live music. When it comes to food, one of the biggest draws by far at Old Settlers is the grange pup, a hot dog wrapped in a pancake-type batter. One year, the festival sold nearly 25,000 grange pups in three days. The fried treat with a cult-like following is sold by one of the 25 nonprofit groups that operate the food booths at the festival. The festival is organized every year by the Johnson County Old Settlers Association, a nonprofit organization. And while the money made from the event doesn’t go directly back to the city, it does make a significant economic impact. 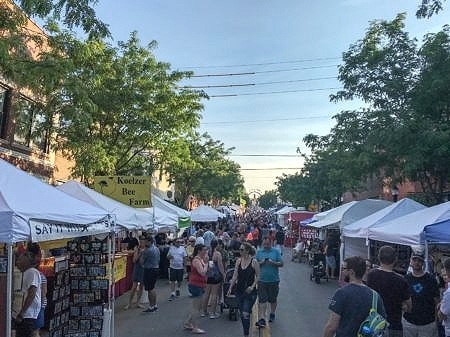 The festival features around 120 arts and crafts vendors and 97 commercial vendors. There will be live music each night of the festival. Then of course, there’s the carnival. On Saturday, the largest parade in Kansas takes place in downtown Olathe at 10 a.m.
More than 60,000 people typically turn out for the event, which features 160 parade entries. If it all sounds like a bunch of good old-fashioned fun, then you would be right. That’s what organizers say is their goal every year. They want a family-friendly festival where you would be comfortable taking your newborn or your grandmother. Organizers say they are trying to carry on the family atmosphere that was started way back in 1898, when residents first started gathering downtown for a community picnic that included a band, bubble gum blowing contests, watermelon seed spitting contests and sack races. Though the events may have changed over the years, the sense of community that the Old Settlers festival brings to Olathe has not. Volunteers say that’s what keeps bringing them back year after year to help put on the event. We LOVE this show and enjoy seeing our returning customers every year! It's in the park, so lots of shade and easy walking and close parking available. You will find us by the crowds around us and and our checked red and white table clothes and pepper smell in the air! This will be our 5th year of doing this show! It's another of our fun shows we attend. Lots of tents and crafters in the heart of the Ozarks! The food trucks offer a wide variety of food and are all very tasty! We are in the same location on Row 13, Booth 1, right across from the "fudge guy" and the next to the "pasta guy". This Arts and Crafts (as the locals call it) is just 9 miles South of our place. We call it the "Little Ozarks". One of the reasons we moved to this area is because of the beauty of the countryside. There are rolling hills, lots of trees and the friendliest people we have ever met. I think this year we will have a beautiful display of the Maple trees turning color. 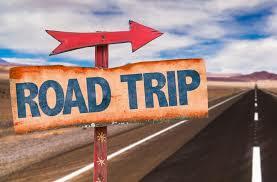 Take the drive down Hwy 7 and enjoy the scenic drive, park in the one of the bus pick up locations and come enjoy the day! There are lots of crafters at this show and it is held on the County Fairgrounds. Sheds, tents, and barns are packed full of all kinds of talented crafters. The food is also really good, food trucks, the boy scouts fundraiser, various local churches put out a tasty breakfast and lunch. My favorite is the Walking Tacos, Rubens and the Fancy Cupcakes, which is next to the homemade ice cream, which is directly across from us on the main walkway. You can't miss us and in case you do, just ask we are well known! The Maple Leaf Festival has something for everyone. 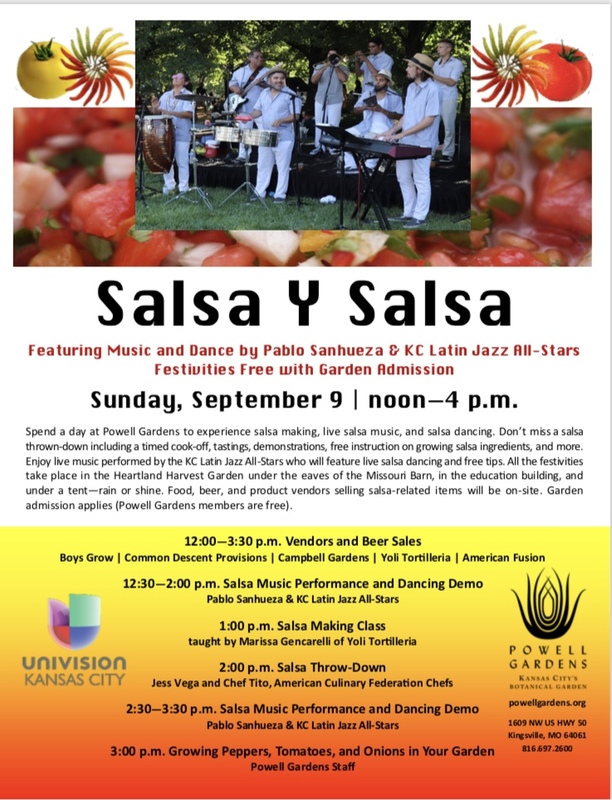 It's one of the biggest events in the KC surrounding area with 350 plus arts and crafts booths. It is a college town and is all about family. Fall colorful trees, Quilt Show, Train Rides, Kid Rides, Tours, Maple Leaf 5K and a Parade and are all about celebrating small town. Come have a sample of our new candied pickle. We will be at our usual location near 8th and High Street. Our Candied Jalapeno banner will be flying high! There is nothing I don't love about Kimmswick's Apple Butter Festival! If you've never been to Kimmswick - GO! It's a teeny tiny town of its own. It's probably only four blocks squared and it's filled cute shop after cute shop! Lots of locally made goods, a tea and spice shop and, of course, the famous Blue Owl (I would definitely encourage you to stop by and get a slice of cheesecake). Kimmswick feels similar to Historic St. Charles, but Kimmswick is even simpler and smaller - and in such an endearing way! During the festival, every street is lined with booths and tents. There's all the usually crafty things you see for sale. And, of course, apple butter! But lawn and holiday decorations seem to be particularly popular here. There's also all the usual food - gyros, funnel cakes, ribbon chips, sausages and more! We promised to come back and we are! This is our second year at the festival and we had such fun last year introducing our candied jalapeños to a new area. We look forward to seeing our new Pepper Fans , we have been shipping to the St. Louis area quite a bit this last year. So hopefully, they will all stock up now that they know how tasty our peppers are! 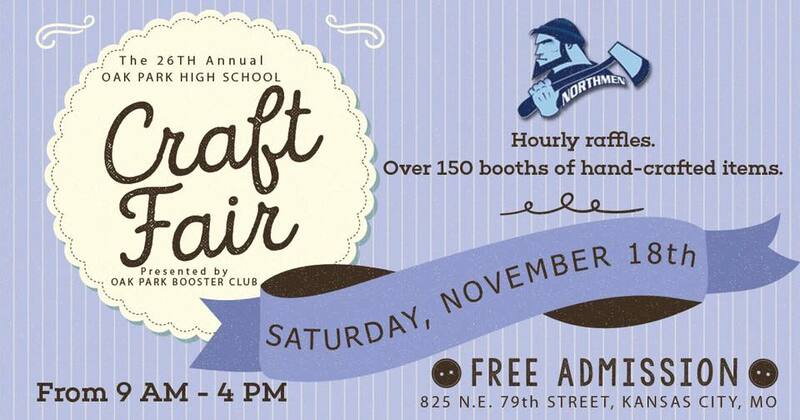 With over 100 crafters with the perfect items for all your holiday shopping! This is the 39th year of this show and one of the very first ones we ever attended. We are excited to sample our NEW candied pickles for you! Our favorite spot is in the hallway, come see us!!! Chick Events hatched in 2014, bringing a pop-up handmade & vintage event concept to Johnson County. Since then, they have hosted over a dozen events in KS and MO including the Handmade & Vintage, Artisan & Holiday events. Their goal is to connect local and regional makers and small business owners with those who love to #shopsmall. At their events you get to meet the maker and learn about their passion, how they got started and you get to support a small business. You also get one of a kind handcrafted goods you often can’t find anywhere else! 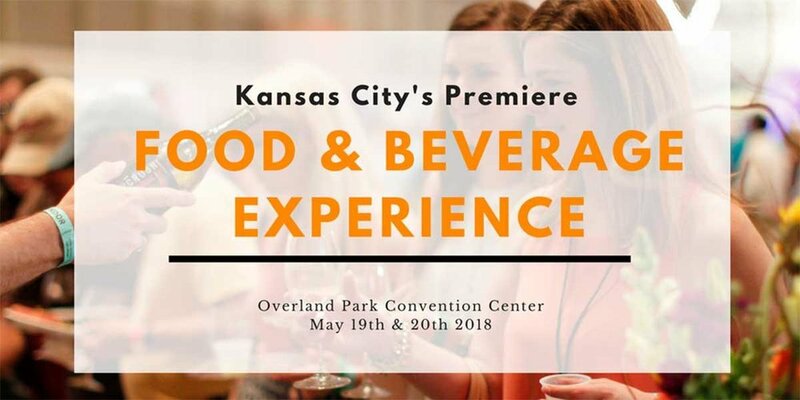 They combine our love for unique products, food, drinks, music and our passion for supporting the maker community to bring fun, unique events to the Kansas City market. Apple Butter Days in Kimmswick, Missouri is where you will find us! We are excited to branch out to a new part of the country to introduce our sweet and spicy peppers to this part of missouri! We are in booth #127 in the area by City Hall and you can always find us by our banner in the air! 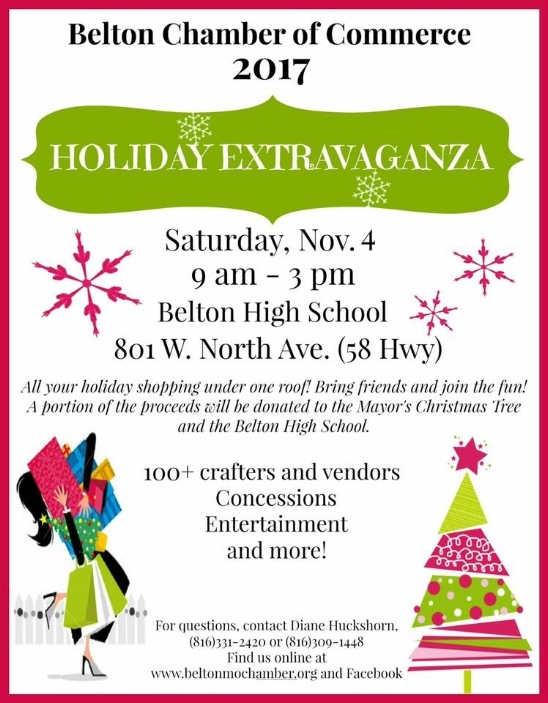 November 19th is the 37th Burlington Christmas Craft Festival in Burlington, Kansas. We will be in our usual location, in the hallway between the two schools! Stop by and sample all three flavors and hear about our show Special and Case special. We try to help make your holiday gift giving a little easier! 2016 Fall Festival Schedule - Save the date for some great outdoor Fall weekend fun! September 17th is the Hillsboro arts & Crafts Festival in Hillsboro, Kansas. They shut the main street down and line it with tents. with over 350 talented crafters from 15 states. It's a fun filled day from 9-4. You will find us across from the tater twisters booth on West Grand Street. Booth #417! september 24th is the overland park fall festival in the santa fe commons park in downtown overland park, Kansas. It is from 9-5 and always a unique show with very crafty vendors! So nice to be in a park with grass and trees and music to be enjoyed while you shop. 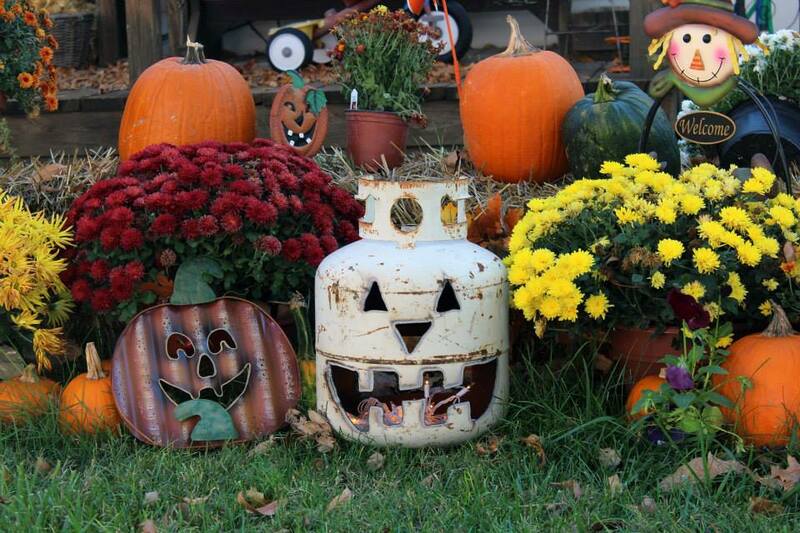 September 30-October 2 is the Missouri Ozark Craft Show in Ozark, Missouri. We love this show and our Pepper Fans, which is why we keep coming back to this event. Located between Branson and Springfield just add some tossed rolls from Lambert's Cafe and you have a great Girls/couples getaway weekend! You will find us across from the mackinac Fudge booth! October 8th & 9th is Sugar Mound Arts & Crafts in our own back yard of mound city, kansas. A shoppers paradise of unique one of a kind crafts that will help you get your holiday shopping started. A very well run show and something for everyone! lots of good food; Walking tacos, BBQ, handmade fudge, homemade ice cream being made right in front of you and specialty foods for any Palate. Some of our favorites booths: Sticky Spoons with their yummy Jams and jellies, honey sticks by christie, Luther's Jerky are just a few! find us in between the barns and across from the Honey Lady as you are just coming down the walkway on the left (South Side). October 15-16th is the Maple Leaf Festival in downtown Baldwin City, Kansas! is just an awesome show with lots to see, shop and do! Perfect for the family or a girls day out! You will find us at the corner of High and 8th Streets, our usual spot! *Our last day at the City Market will be September 10th. You can always find our peppers at The Taste of Brazil Market. They are located on the North side of the market on the east end OR find us in your local store and specialty shop throughout Kansas and Missouri. please Check out our "stores" page for more information! You will find us at holiday boutique on November 19-22, 2015 in the overland park convention center in overland park, kansas. we will be in booth #630, on the south/east side of the main room! Stop by and enter our giveaway drawing and be prepared to shop and have fun! Girls night out is Friday 5-9 and country girls night is Saturday 5-9! Maple Leaf Festival in Baldwin City, KS is October 17th and 18th! Fall at it's best in this beautiful college town! Over 300+ Vendors show off their wares, a parade, kid zone, ride the Midland Train to Nowhere, KS and a variety food for everyone! 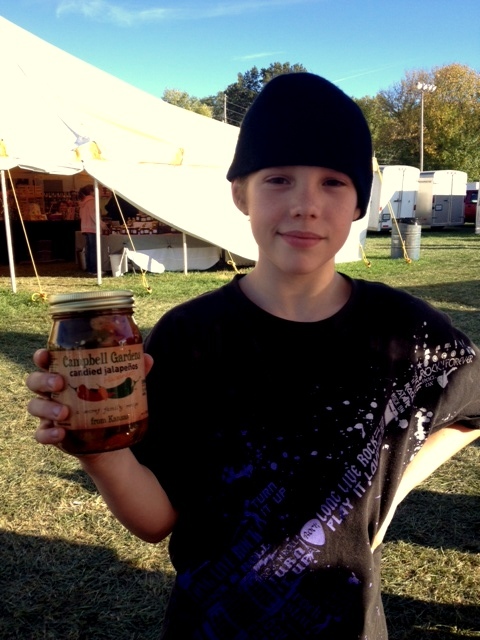 Amos last year with his favorite jar of peppers! Every Saturday during the summer we will be at The Farmers Market in historic downtown Kansas City, Missouri. Check in with us on our facebook page: Campbell Gardens Candied Jalapenos for our location at the market. We will either be under the sheds or in our tent! We also will send out a Pepper Post every week keeping everyone updated about weather conditions and our location! Check out the below link for information regarding hours, events such as concerts, car shows and much more! We are excited to do this show for the first time! Each year exhibitors from across the nation are selected by a committee of judges and invited to bring their handcrafted products to Hillsboro for its nationally recognized craft show. 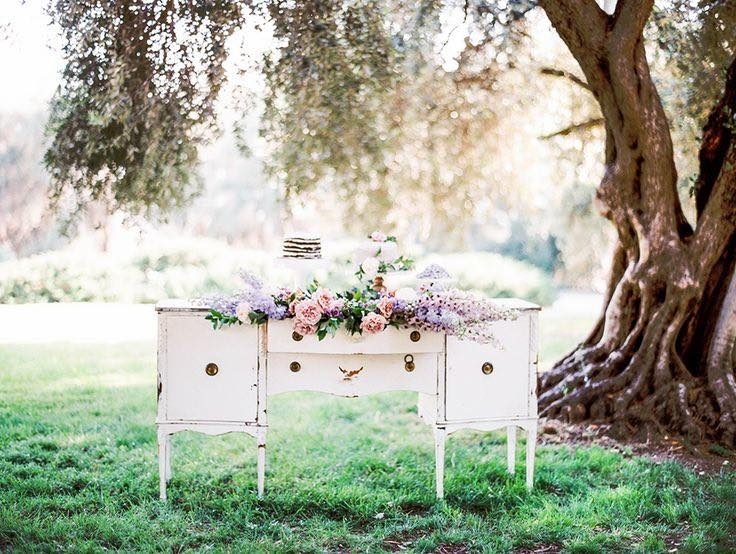 These experts come from each coast to display and sell their handiwork and one-of-a-kind creations. 3 p.m. Headline Performance - The Elders. We have heard this is a great show filled with all various forms of arts and crafts. This will be a new festival for us and we are looking forward to visiting this part of Missouri and sharing our peppers. For more festivals in Branson, Missouri and surrounding areas check this web site out! It now has 400+ booths displaying all types of hand crafted items with exhibitors coming from Oklahoma, Arkansas, Nebraska, and Colorado and as far as California to join Kansas exhibitors of crafts and art work. Each year on the second weekend of October Mound City’s population swells from about 1000 people to 10,000. Visitors come to shop for craft and art work as much as to eat the taste temping foods. Come view the changing colors of the Maple Leaves in beautiful Baldwin City. With over 300 craft exhibits, quilt shows, preforming arts and music. The biggest fall event in the area with something for everyone!